The first little micro-car “mouse” I built for my kids. 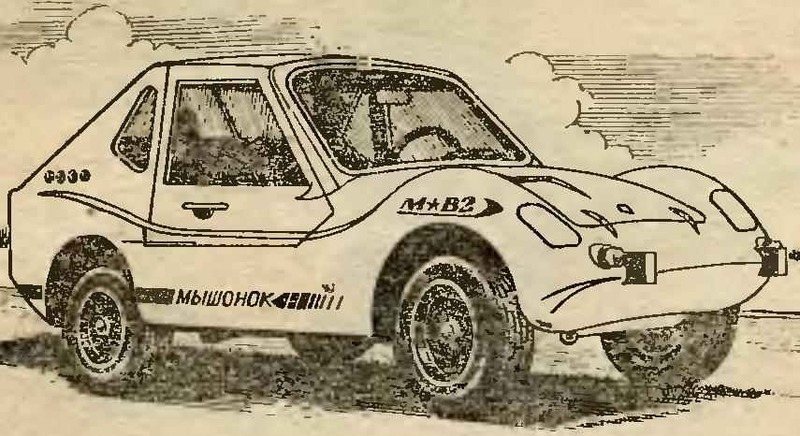 As far as he was able, the readers of “Modeller-designer” can tell, after reading his description and drawings, published in “M-K“. As a result, I accumulated some experience of designing and has already planned not as a child, and “adult” car. Called it “mouse-2”. Built a long time, or rather, not so much built, how many were looking for the necessary parts. This, in particular, due to the use of “Mouse-2” mechanical brakes (now I change them for hydraulic). Development drawings and the construction was carried out simultaneously, although the basic parameters of the “Mouse-2” was thought out by me in advance. Bring him brief technical description. This twin four wheeled vehicle with an engine producing 14 HP (working volume of 346 cm3) located in the back. Equipped with two independent braking systems: a primary (working) foot all-wheel drive and a spare (side) lever actuated on the rear wheels only. A certain enthusiast by the name of Simon Whitlock set out to build not just powerful, but very powerful motorcycle. You can go simple way – to attach to a motorcycle frame any brutal engine of a large volume, such as from a Viper or Corvette, but then the design would be too bulky and large, which is undesirable. 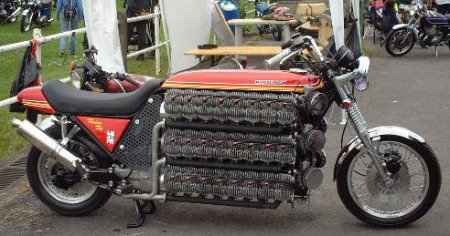 And then this enthusiast found is not quite simple, but very elegant solution – “rasterman” 16 motorcycles Kawasaki KH250 parts, he United their engines as one, the result of which was monstrous 48-cylinder engine weighing almost one ton. 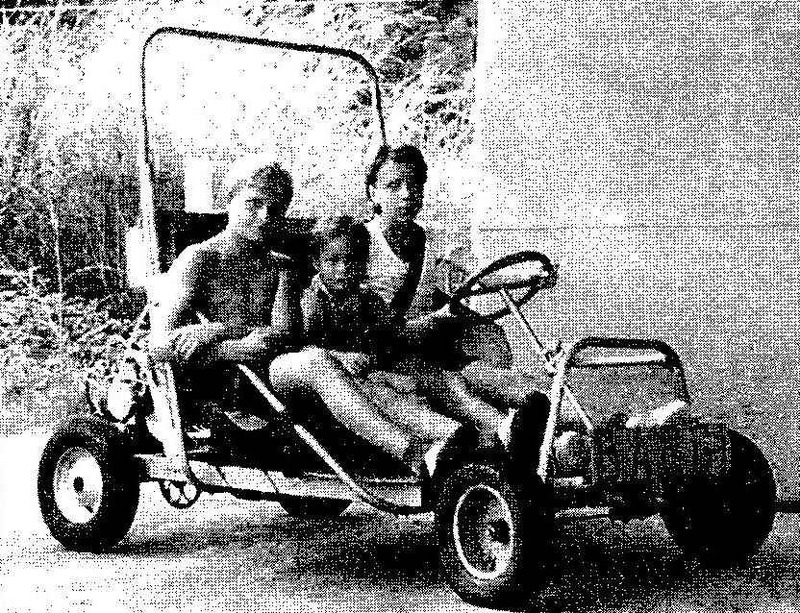 Dream-the idea of making a car, even simple, like buggy, appeared in his teenage years, when machines were in short supply. But for many UNDERSTANDABLE reasons (had neither the experience nor the tool nor the means) she could not at that time be done — and ended only with drawings on paper. Over the years the opportunity came to build, and the boyish idea has revived in my mind. On the profile of their work by this time, I’m already quite versed in the device of conventional cars, which helped me during the implementation of the project. Our dictionaries, even technical, somehow paid attention to this type of machines is buggy. 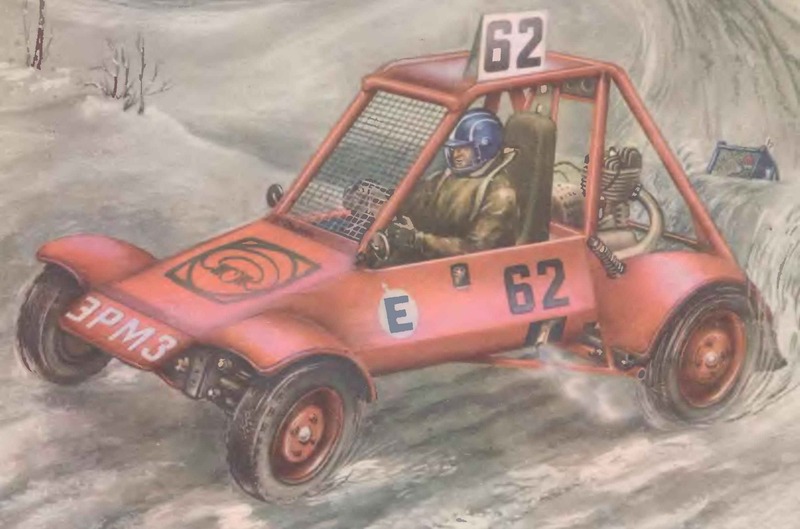 But with the current accessibility to Internet resources was not difficult to see and understand what constitutes a real cross sports or recreational vehicles called “buggy”, which translated to English means “bug” or “flea”. And in fact — this is the machine for driving off-road over rough terrain or desert the coast. In my experience, Amateur-built craft it so happened that this small pleasure catamaran “Fish” — not the first and it built it even later than the great tourist nautical quadruple (also sailing). Something small large ship repeats — for example, dvuhkonusnyh (or rather, double) a cutter scheme, a set of power elements, the material used. However, many of the same type (single-purpose) nodes and even the details are different, except, of course, standardized purchased products. 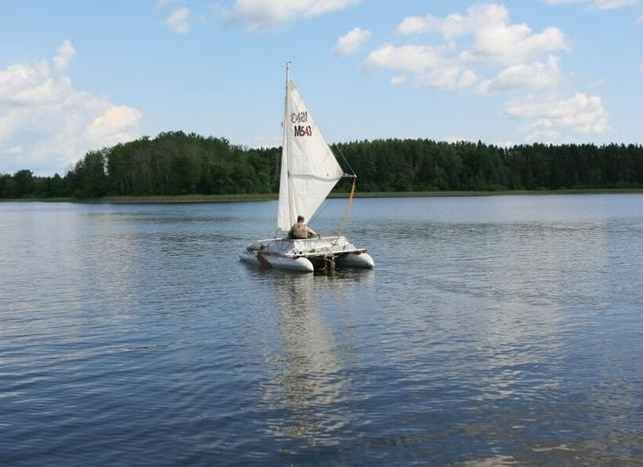 Catamaran “Fish” is not only small in size but simple in design, and able to build a beginner shipwright. But even a relatively small size do not allow to store it in internavigational period, assembled, not to mention the possibility of conveying to the “big water” at least for the trailer car, and especially in the construction of passenger vessels turned out that this small pleasure catamaran “Fish” — not the first and it built it even later than the great tourist nautical quadruple (also sailing). Student design Bureau Carian Polytechnic Institute named after A. M. Gorky is known not only in redkach edges, but also far outside the Republic. 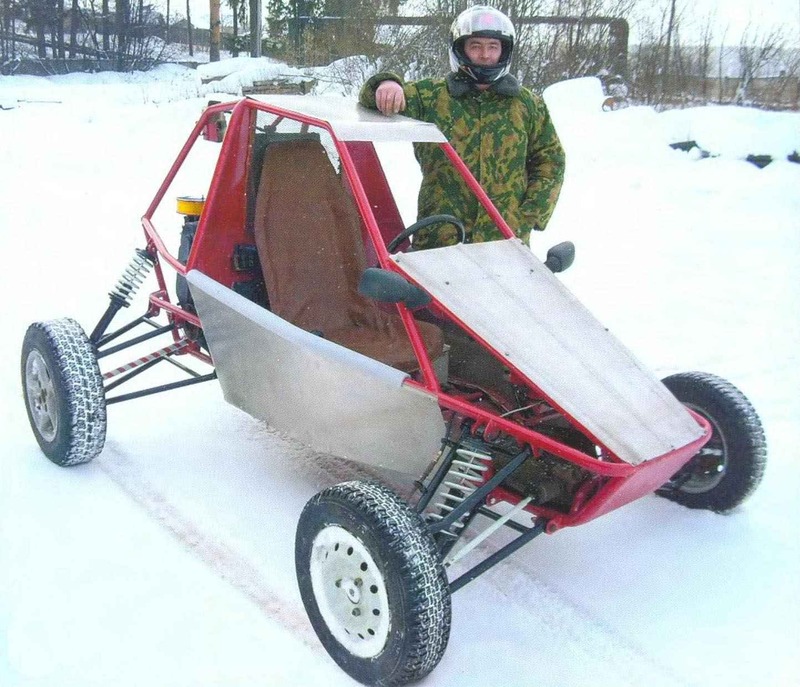 The original snowmobile, transport on an air cushion, knapsack aredigital and other developments, which are not repeatedly described in “M-To” attract the attention of specialized organizations. SKB has been around for almost a quarter of a century. Today is a great scientific and experimental unit of the Institute where research is being conducted on a number of topical issues, and most importantly, CSC provides a massive attraction of students to scientific-research and experimental-design works. Now there were seven groups, each developing “its” subjects. The boys bent for to the technician, probably in the genes. Only now their life is quite a long period (the so-called transitional age) when playing with toy cars they already feel shameful for himself but to get behind the wheel of this car — they haven’t got the time, most often such just is not even from my parents. But with such boys, we have designed and built several simple, but real cars, slightly differing in size and execution. But because those of them that little more, we have given the name “buggy”, and their smaller “cousins” called “cards”. 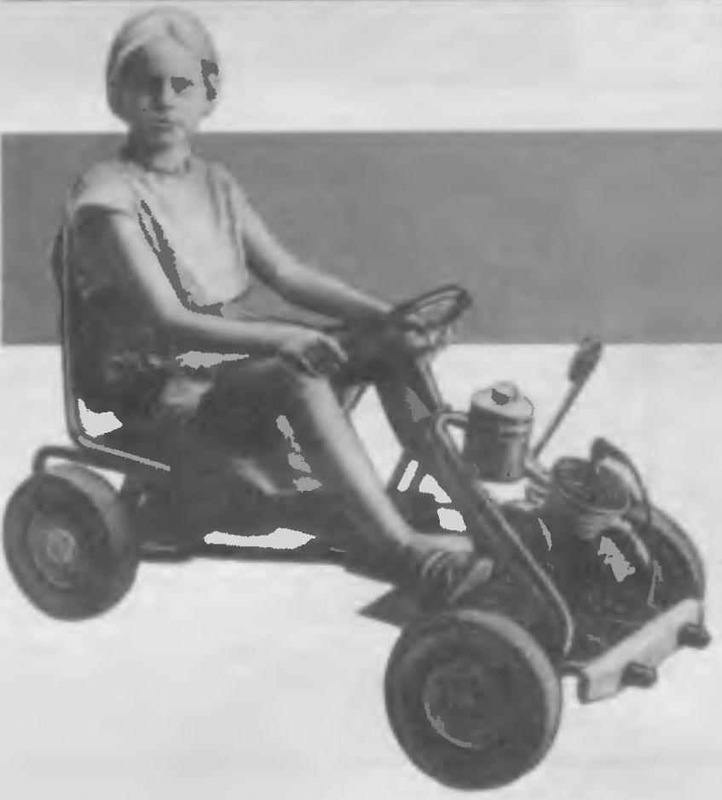 Pedal cars of the type “Card” and “the idea of crossbreeding”, produced by our industry, are very popular with children. 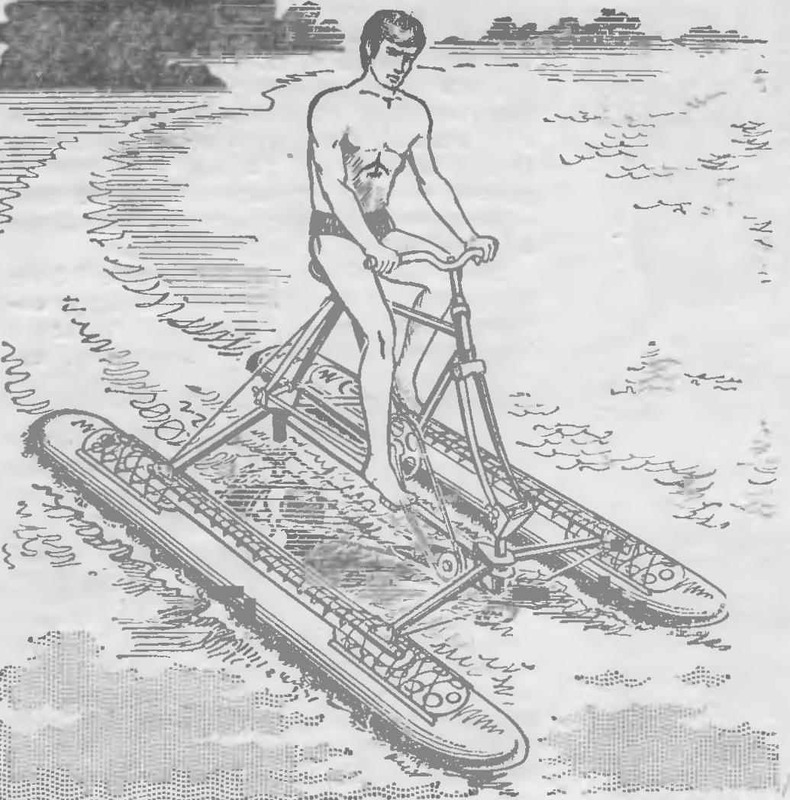 But these machines could be even more widespread, when combined with D-6 engine from a motorbike and a bit modified. The result is a real baby sports car. When my nine year old daughter, Vita (the way, she began to ride from the age of seven) leaves the yard in his car it is of interest not only in children but also in adults. Wanting to ride ia car rife. And ride everyone, boys and girls aged 6 to 12 years. Vehicle speed up to 30 km h For beginners it is too much, but there is a simple device which at first can be limited to 10-15 km/h. Driving a car is not difficult — because of the management bodies of all four: wheel, brake and two pedals — the left pedal is the clutch, and the right of the gas pedal. If some time ago the author said that he would have to “reinvent the wheel”, he would take it as a joke. However, the skepticism has vanished after discovering a magazine with a model of “vetrohod”, made by Alexander Twins. The model had air and propellers sitting on the inclined shaft, and moved strictly against the wind under the action… of the wind! It seemed tempting to do on this single principle vetrohod: two Bicycle wheels, if the spokes in pairs to paste over thick fabric, could serve as a multi-blade wind turbine, the rotating propeller via a chain drive. But what to do when there is no wind? You can turn the wheels pedals! Then the wheels turn into propellers, and the propeller as in the previous case, is used lo its intended purpose. However, this transmission was quite difficult and promised big losses. Every Sunday the gates are opened to the sports section “Buggy ERMZ”. To the factory yard with the characteristic of motorcycle engines crack go dirt buggy. Today exercise. Guys this day is going to the most and everyone wants to try the forces in front of its closest competition, after all, to drive lucky one who has shown the best result of training and worked hard in the creation and preparation of the machine for the contest. The guys mostly 16-20 years, many of them are passionate about technology with 3-5 grade and have Sidney wit. Sports for them is a favorite form of leisure. But soon they will graduate come to the production, army groups, and the technical knowledge and practical sports skills, fitness, purchased in the sports section, will probably come in handy in life. Practice shows that those who engaged in technical sports, proactive and hardworking in the production, they usually say “Jack of all trades”. 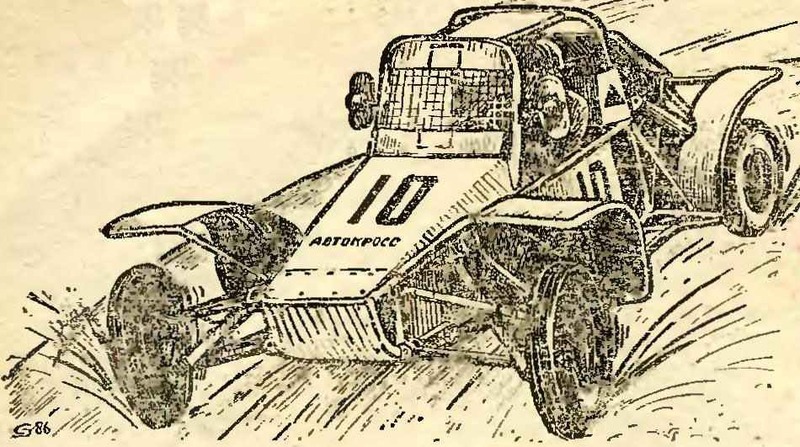 Say, in the Urals during the difficult years of chaos after the civil war an artificer built a car where everything was wooden, even the engine. 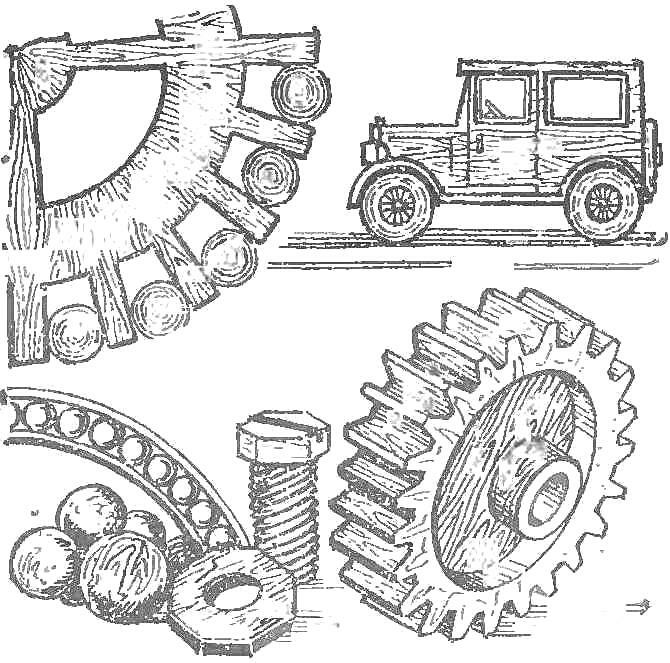 However, if the wizard so the echo legendary as Leskov’s Levsha, here the use of wood instead of metal in the most important nodes in modern machinery: rolling mills, tractors, cranes, harvesters — not a legend, but a reality of our days.